always inhabiting the newest chamber. Chambered Nautiluses are described as living fossils because their ancestry dates back 500 million years to the Cambrian Explosion, but… the longevity of this species could be threatened because the nautilus’s graceful shell has made it an attractive commodity for the commercial shell trade. Traders from Indonesia, Fiji, and the Philippines capture nautiluses using baited traps. 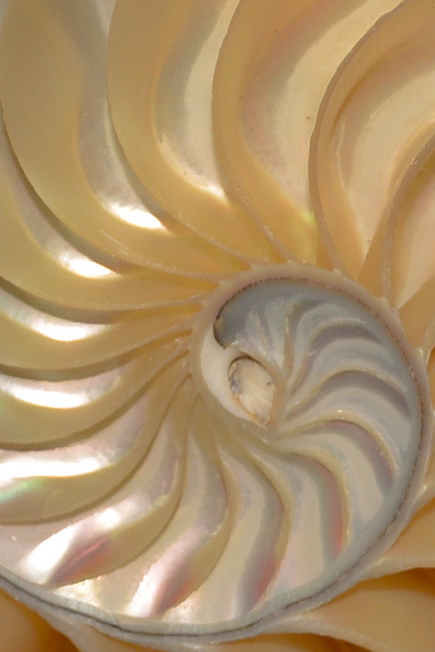 Conservation concerns have been raised due to nautiluses’ slow rate of reproduction. In Indonesia, it is illegal to export nautiluses. The nautilus has an unusually long life span for a cephalopod. It takes several years to reach sexual maturity and may live more than 15 years. Nautiluses will reproduce annually once they’ve reached sexual maturity. Eggs measure more than an inch in length, making them among the largest of invertebrate eggs. They have an exceptionally long incubation time, ranging from nine months to over a year. No one has ever seen nautilus eggs in the wild so little is known about the environment in which they are laid. VERY nice Jane – love the capture and the text! Beautiful and poetic. And such a great submission. Wow – that is soooooo gorgeous!!! Hey! I like your new comment introduction. I tweaked mine this past week based on our discussion. I’m always amazed by the structures found in nature. Form follows function.